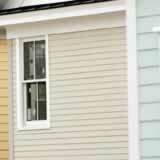 Why are the quotes to install vinyl siding on your home so much higher than what it cost your neighbor? If your house is about the same square footage and you're using the same type of siding, shouldn't the price be about the same? Before jumping to the conclusion that you should look for a cheaper contractor, a comparison of the two homes' architectural styles might be in order. The price to install vinyl siding on your home usually comes down to two primary components: the cost of materials and the amount of labor the project requires. If you know the house across the street is about the same size as yours and the same siding is being installed, what could cause your labor and materials to be higher? Height -- Two story homes often require more time to side than those on a single level. If your square footage is on two floors and your neighbor's on one, the labor to set up and move extension ladders could cause your vinyl siding cost to be higher. Corners -- How many inside and outside corners are on your home's exterior? Every corner necessitates the installation of trim that can increase both labor and material costs. Numerous offsets can also create a lot of additional panel cutting that may result in more labor. Dormers -- Few features add more pizazz to a home's roof line than dormers, but they can also increase your siding price. A lot of small sections of siding cut at angles to match the roof pitch usually mean higher labor costs. Windows -- While windows may be great for allowing natural light into your home, they can also affect your siding installation budget -- especially if you have more exterior glass than the average house. Siding panels must be cut around every opening, and depending on the window design, you made need special trim installed to prevent water intrusion. Roof design -- A cut-up roof can add character to a home, but it might add cost to your vinyl siding project, as well. Every change in roof pitch or offset in elevation that exposes a vertical portion of exterior wall creates an area where siding must be installed. Many of these locations can be difficult to access and may need a lot of intricate panel cutting. These are just a few of the architectural features that could cause your siding estimate to be higher than your neighbor's. Of course, when it comes to hiring a contractor to install vinyl siding on your home, it's always a good idea to get several estimates.